The eyes are of medium size, almond-shaped, slightly slanted and not protruding. The color of the eyes should be as dark as possible. Light, piercing eyes are undesirable since they impair the dog’s impression. 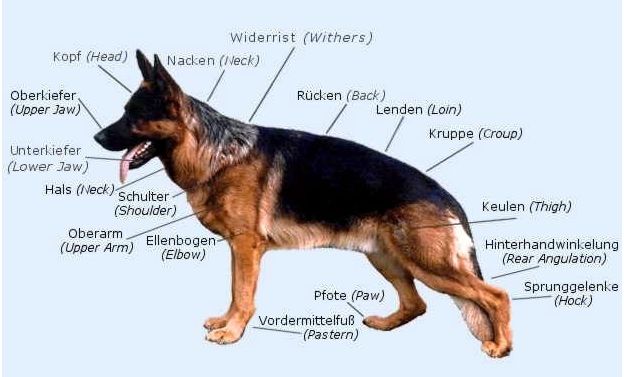 The German Shepherd Dog is bred in the hair varieties double coat and long and harsh outer coat – both with thick undercoat. Unobtrusive, small white marks on chest as well as very light color on insides are permissible, but not desirable. Dogs with lack of mask, light to piercing eye color, as well as with light to whitish markings on the chest and the insides, pale nails and red tip of tail are considered to be lacking in pigmentation. The undercoat shows a light tan to silvery tone. Solid white is not permissible. b) Dogs with proven “severe hip dysplasia” and "elbow dysplasia"